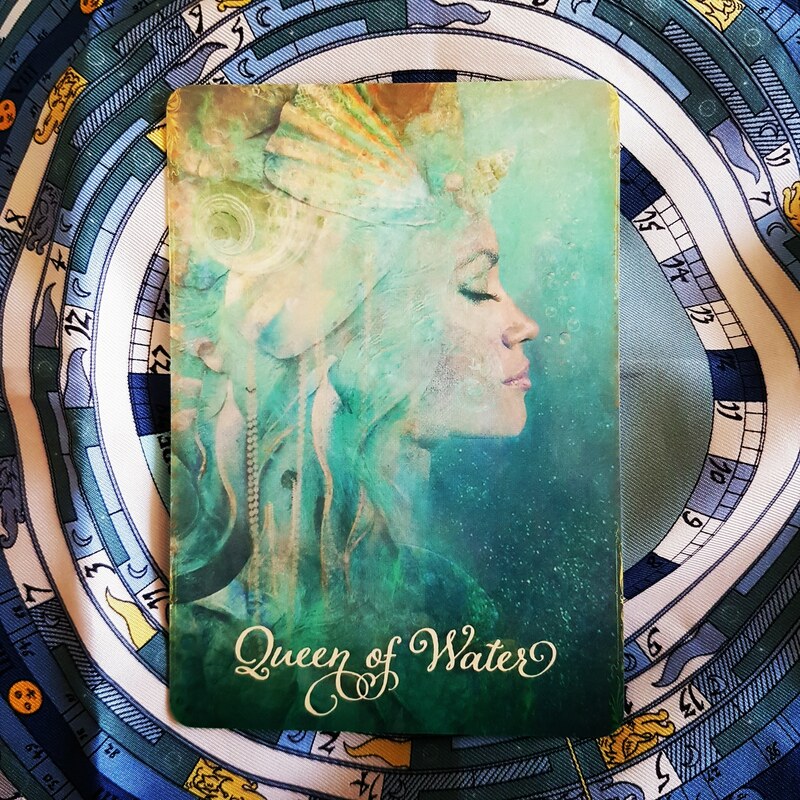 Ace of Water – You are filled with love from Spirit and joyously let it flow out to others, where it fertilises the seeds of co-creation. Love gives you hope, shining brilliant light on all the possibilities available to you. You are optimistic about bringing dreams into being. Spirit always informs you and guides you, allowing you to illumine the darkest of places. 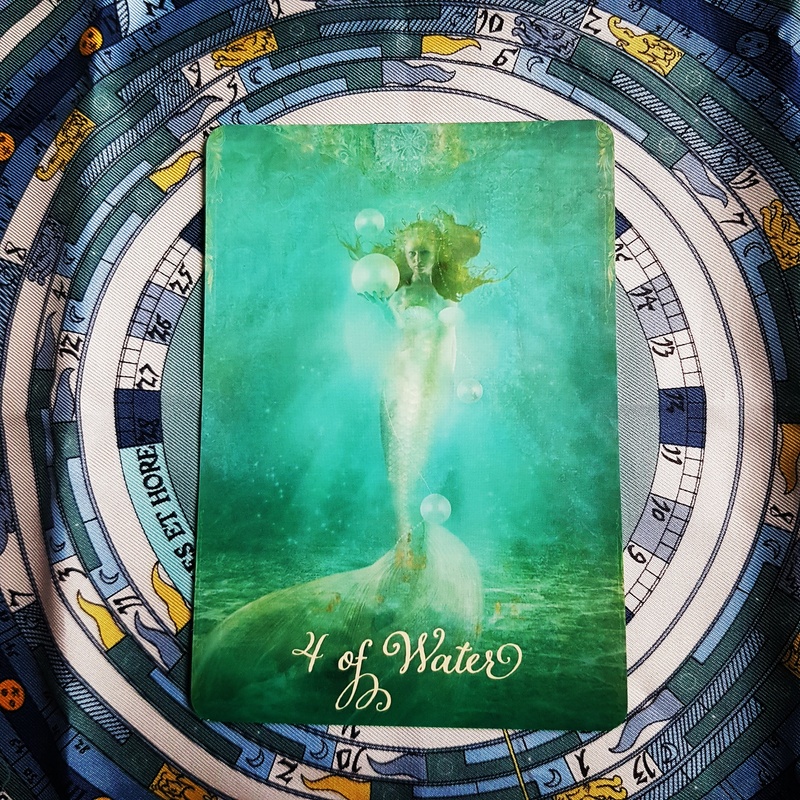 Keywords: unconditional love, overflowing abundance, the fertility of love. 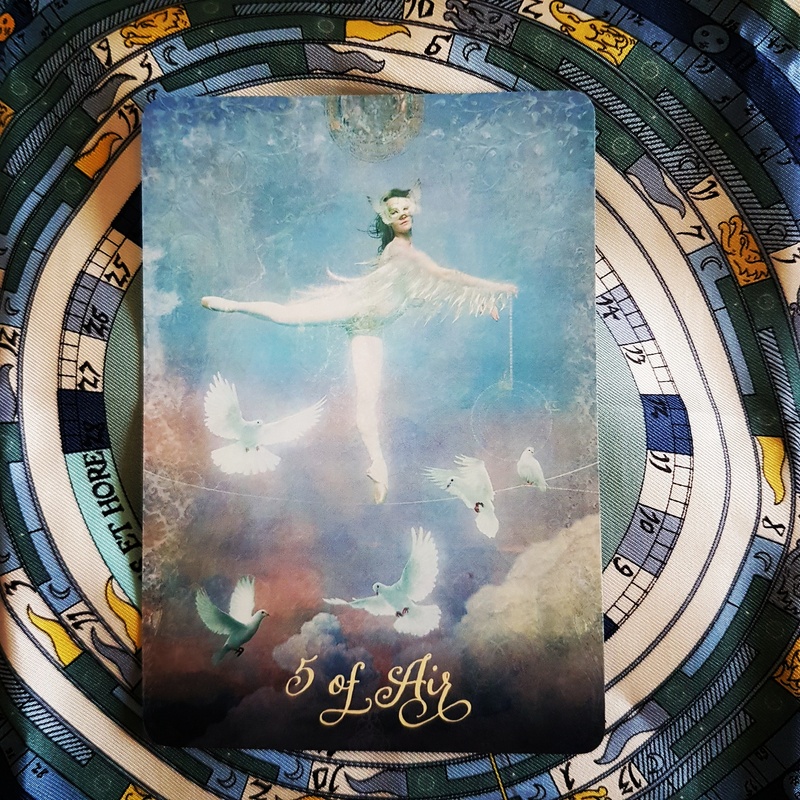 5 of Air – Conflict is a good way to see your motives and intentions. You can use this experience to grow into a more authentic version of yourself. It’s not important to win. It’s important to have integrity. Other people have different ways of thinking and may not always be in agreement with you. You open to this opportunity to live and let live. Keywords: tension, conflict. 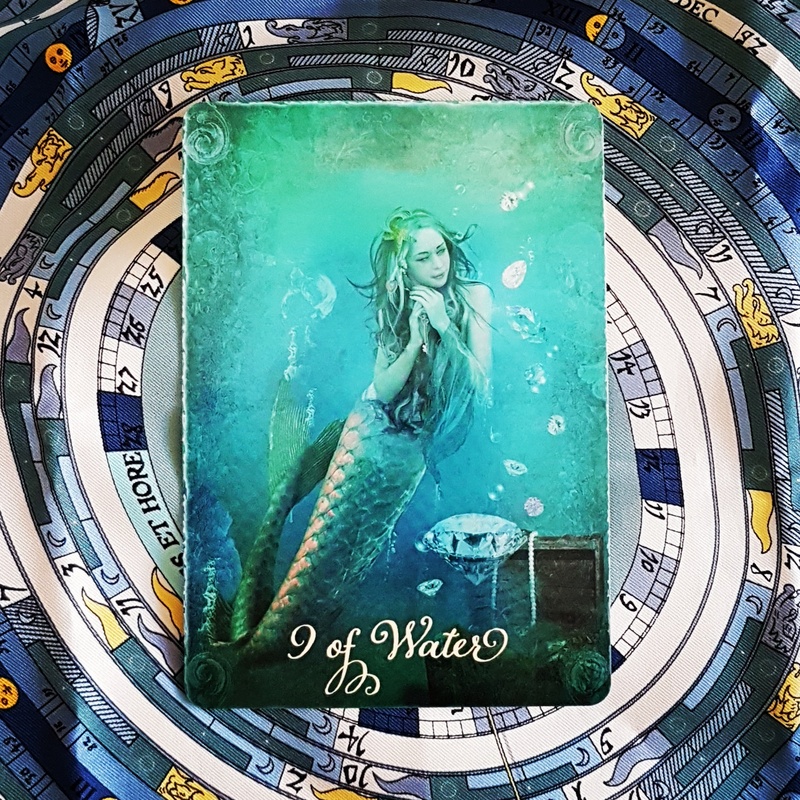 9 of Water – It is right to say no to what isn’t right for you, and now is your time to experience wishes fulfilled, the sweet harvest that came about from seeds you planted. You drink in the aroma of successful endeavour, take pride in your hard word and achievement, and savour the satisfaction of a job well done. You deserve to pause and acknowledge all you co-created and you do it joyfully. Keywords: dreams come true, wishes fulfilled, completion, enjoyment, contentment, achievement of desire. 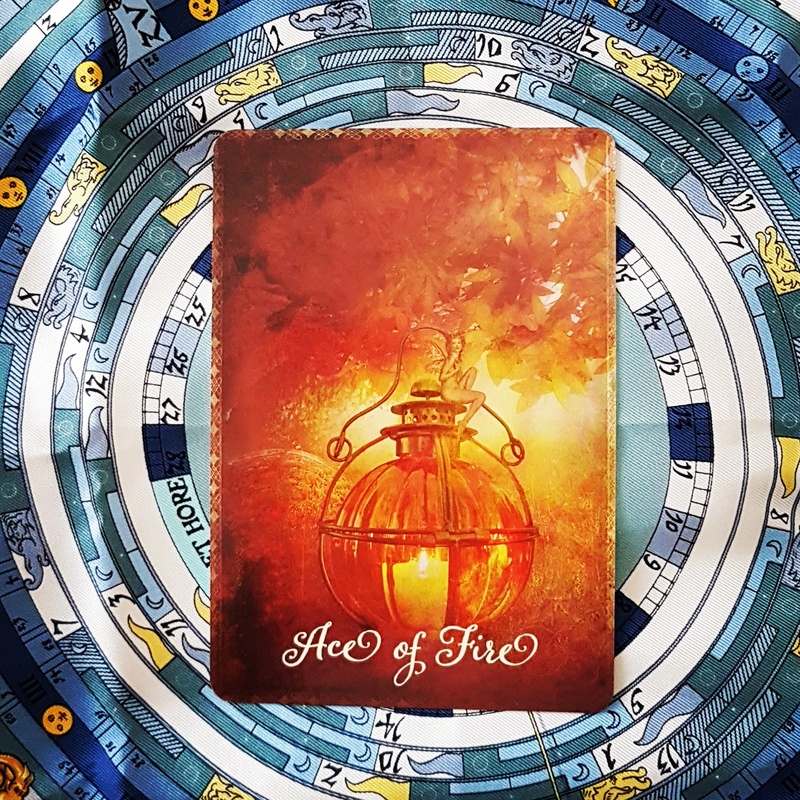 10 of Fire – You may be overcommitted and have taken on too many burdens. In this moment, you do the work of decluttering your life. 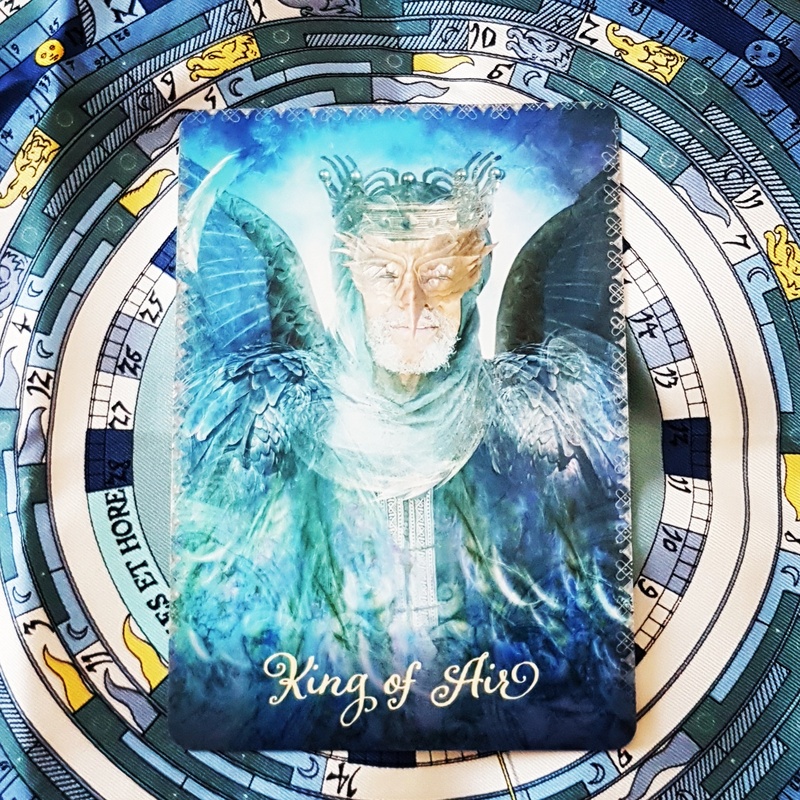 All that you release will take new form and serve the greater whole, but you no longer need to hold on to it simply because it once seemed to have value for you. 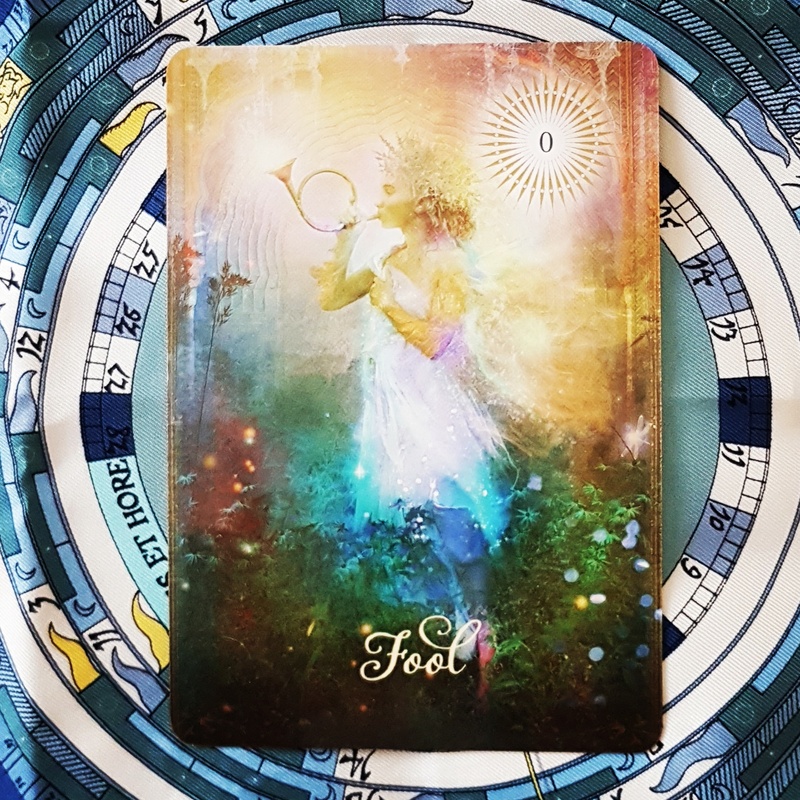 You thank it for what it did for you, but say goodbye to the emotions, relationships and situations that you realise do not belong in your life any more. 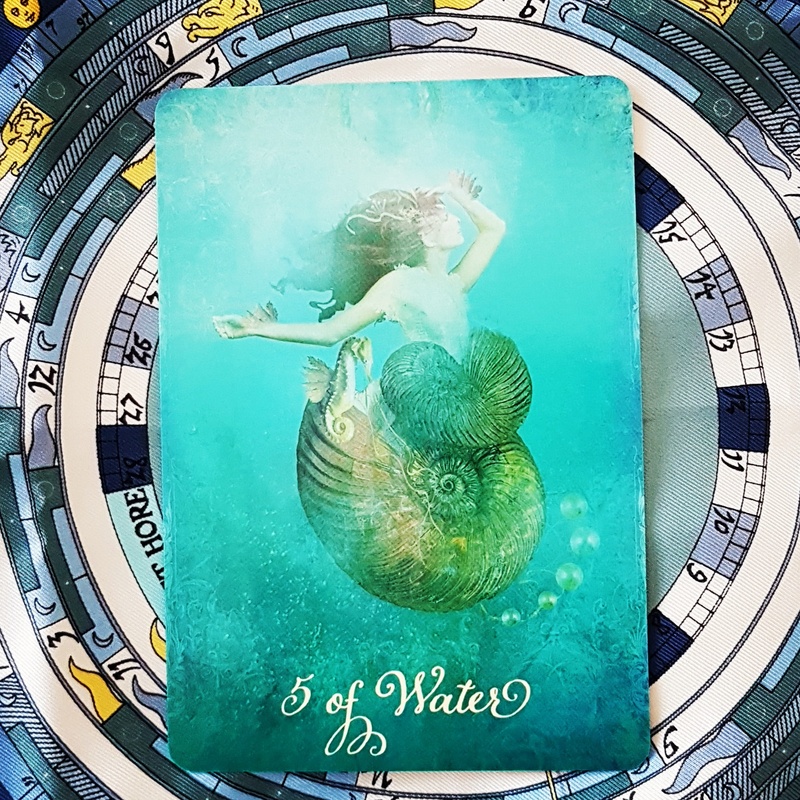 Messenger of Water (Knights in most other decks) – You need to look for the best in others and honour it even when it seems a challenge to do so. Your attractions stem from self-love and a knowledge that you are a part of all love, which takes many forms, each exquisite in its own way. You can have what you desire. There is no need for jealousy, anger, resentment or fear when you are love and love flows into you powerfully. 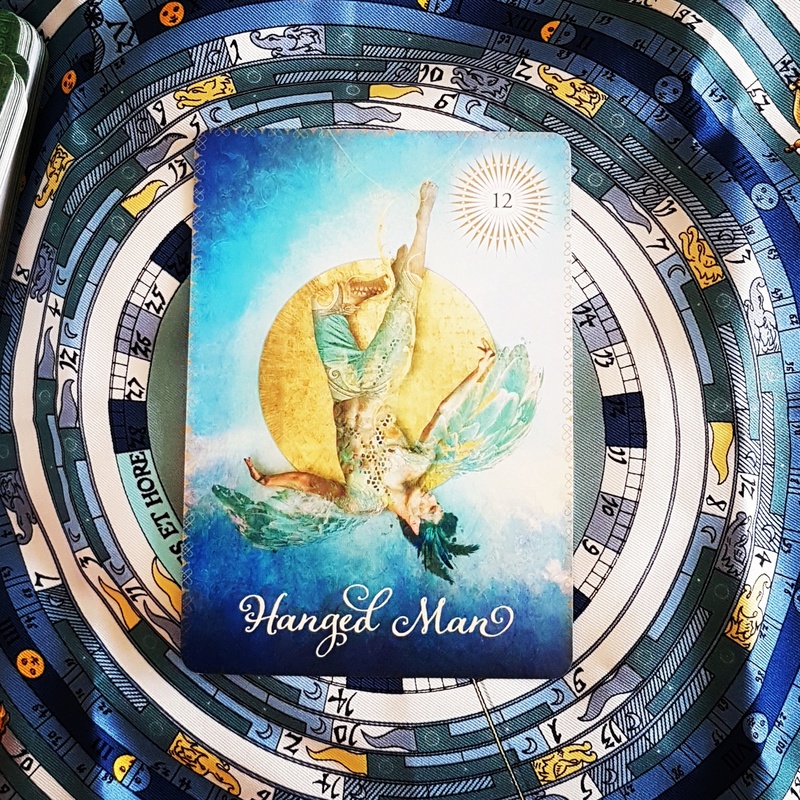 Keywords: romantic attraction, chivalry, admiration, seeing the best in others, heightened emotional awareness, a call to fall in love with yourself.